Welcome! 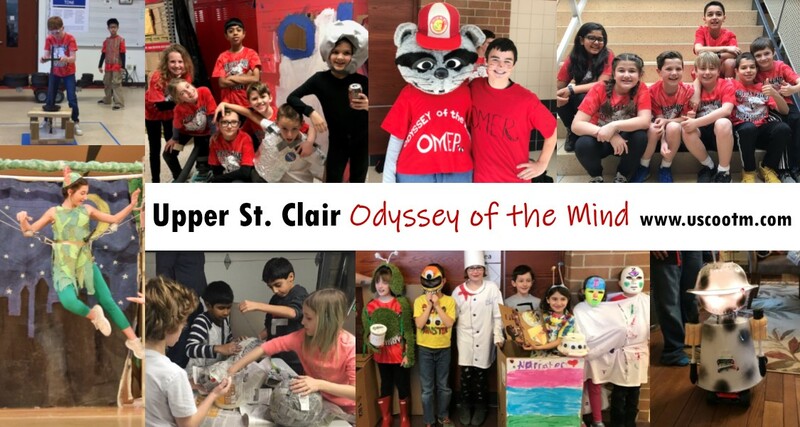 We're so glad you've decided to register for Odyssey of the Mind in Upper St. Clair! Please keep in mind that registration does not guarantee your child a spot on a team. We aim to create as many teams as we can but are limited by the number of parents who volunteer to coach. Please consider coaching! Without coaches, there can be no teams! Odyssey of the Mind teams are formed by division which is determined by your child's grade level. Each team can include no more than seven students. By registering, you are not committed to joining Odyssey of the Mind. (Yet!) After registering, you may decide OM is not for you or your child. You can leave the program at any time before October 31, 2018. After this time, fees cannot be refunded. Registration fees will be collected after you are placed on a team. So please register if you are interested, curious, or want to learn more! We cannot try to place you on a team unless you have registered. Name of school if "other"
Team Assignment Requests - We do our best to accommodate requests, but cannot guarantee a spot on a particular team. If you have friends who you would like to be teamed up with, please list names their names in the box below. Ask friends to enter your name on their forms as well. You can also use this space to request particular coaches. Along with our website (www.uscootm.com) and regular emails, we use Facebook to communicate updates and events. Please "like" our page at http://www.facebook.com/uscootm/! What other social media do you use on a regular basis? Our Odyssey Kickoff will be held on Wednesday, Oct 3, 2108 from 7:00-8:30pm at Boyce Middle School. All Odyssey families are welcome to come, but this is a crucial meeting for anyone new to OM. Prior to October 3, you will receive an email with your team placement. At the Kickoff, you'll have a chance to meet with your team, compare schedules and, if needed, identify a coach. We will also introduce the problems for the year and discuss the OM season timeline. Experienced coaches will be on hand to answer any questions and kids will have a fun spontaneous activity! Yes, I will attend the Odyssey Kickoff with my child. NO, we will not be attending. Upper St. Clair Odyssey of the Mind is a school-supported, parent-run organization. In order for your child to be part of a team, every family MUST volunteer in some capacity to help the program thrive. Specifically, each team needs two co-coaches, two judges and a tournament volunteer in order to compete. Working with Odyssey teams is exciting and rewarding, and we provide lots of training and support for coaches and judges! USC Odyssey of the Mind also needs volunteers for various programs we run throughout the year. Look out for an email at the start of the season detailing how you can help at USC Odyssey events such as Round Robin Skills Training, Dress Rehearsal, the All-Star Recognition Reception and Ingenuity Camp. Volunteering is ESSENTIAL to the success of our season. I understand that I will be required to support my child's team and USC Odyssey of the Mind by volunteering. Co-coaching. (Fantastic!) Acting as a Long Term Problem Judge at the Regional Tournament on March 2 and if my team advances, at the State Tournament on April 6 in the Poconos. (Must also attend required training.) Acting as a Spontaneous Judge at Regionals on March 2. (Must also attend required training and Spontaneous Fun Day in February if your team elects to participate in this optional tournament.) Volunteering at the Regional Tournament on March 2. In accordance with state law, some of our volunteers will be required to have clearances. Please begin the process of securing your clearances if you will be volunteering in a position that will put you in direct supervision of our kids. For more information about Upper St. Clair's volunteer clearances requirements, please refer to the home page of the school district's website www.uscsd.k12.pa.us and click on the Volunteers and Required Clearances link. Thank you so much for your cooperation! For the team - building supplies, hot glue, duct tape, props, costumes, and any other needs as the team develops a solution to their problem. For the program - for national Odyssey of the Mind registration fees, facility rental fees, USC workshops, spontaneous practice supplies, end-of-the-season awards, etc.